23Shutters Camera Club is a community of hobbyist and photography enthusiasts who wants to share their photos with others and learn to become better photographers. Here we go again. I'm sure most of you who attended the DPP 3rd Year Anniversary can't forget our favorite bartender Derick Gamboa pouring the free flowing beer and yours truly getting royally smashed and throwing expletives while live on MTV! Yes, what a crazy day it was. Guess what? We had so much fun we have to do it again. Entrance Fee: FREE with our UNLEASHED Pass. What to Expect: Just lectures from the country's best photographers, a LIVE SHOOT with beautiful models (only hot chicks for DPP! ), an entertaining and educational LIVE JUDGING with a motley group of judges, and a raging party right after. Did you read that correctly? FREE? Yes, our UNLEASHED Anniversary Party is FREE. Unlike other photography events that charge you P 3,600, we don't charge you one stinking centavo. Can anyone attend the workshops? NO. 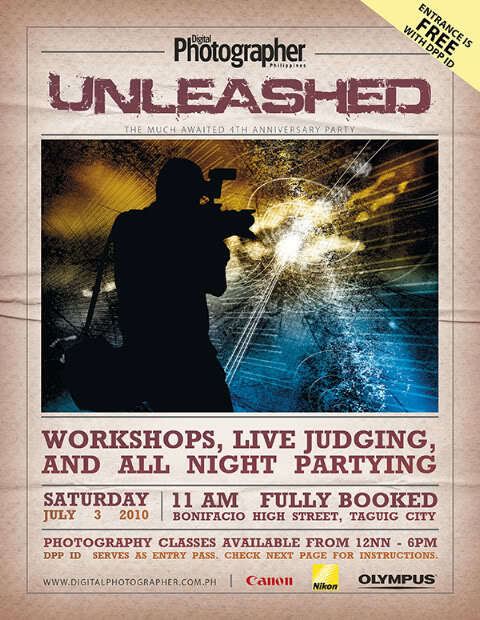 You will need our UNLEASHED Pass to attend the workshops. How do you get this pass? Simple. Its inside DPP ISSUE 32 which is out in the stands next week. To those cheap bastards who opened magazines to steal passes last year, guess what, we printed the passes on a magazine page and that page is bound to the magazine. Who are the speakers? Off the top of my head.....Pilar Tuason, Xander Angeles and Niko Villegas, Jo Avila, John Mateos Ong, Paco Guerrero, Mark Dimalanta. I will add more to this list over the next few days. Just a quick background on Paco Guerrero, he was featured in DPP 31 and is probably the best lifestyle travel photographer in this country. Mark Dimalanta is a Pentax Japan sponsored photographer who specializes in surf and sports. Just confirmed today 5/27 that Jay Tablante will be speaking. Will there be a LIVE SHOOT? We are still awaiting confirmation from High Street but the odds are stacked for a YES. We'll see if we can have two shoots. Are you going to be more organized this Year than last? HELL YEAH! We thought we were going to get 200 participants last year but we got 700 instead. We're ready this year. Attendees will be PRE-REGISTERED before going to Fully Booked so no more waiting in long lines. How Many Classes will there be? We have the ENTIRE FULLY BOOKED reserved for DPP. That means there are three lecture rooms that can seat anywhere from 40-80 people. If classes start at Noon and go till 6 pm, at one hour length, we will have 18 different classes. We will probably have less, maybe 14-15 different classes since some classes may need more than an hour. What is the Class Schedule? I will be posting this over the next two weeks. What Topics will be discussed? Most everything. You can expect subjects like Portraits, Beauty, Lighting, Strobes, Landscapes, Wedding, Photoshop, Travel, Color Management, and much more. What about that crazy Live Judging? We'll have it again this year. I will finalize the topics and start a separate thread for this in a few days.